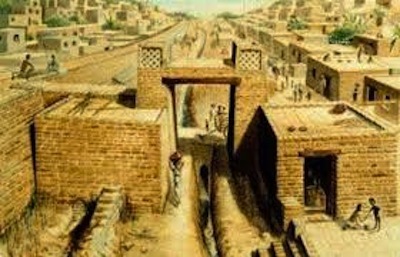 Harappa is an archaeological site in the Punjab region of modern-day northeast Pakistan, which was once part of India. It's located about 22 miles west of the city of Sahiwal and is the most famous of the Indus Valley Civilization. The site contains ruins of a mature ancient city that was once at its prime during the Bronze Age of India, which was when advanced metal working first became part of Indian culture. It's believed that the city had over 23,000 inhabitants more than 5,000 years ago, which was a lot for its time. The first Indus Valley Civilization, city seems to have been the city of Mehrgarh at around 6000 BC. However, the two most significant civilizations were called Mohenjo-daro and Harappa, which seem to have both emerged around 2600 BC along the Indus River valley, in the areas of Punjab and Sindh. These ancient civilizations developed a form of writing, built community gathering areas, and had diversified social and economic systems. They were discovered in the 1920s. After they were excavated, many other sites, ranging in location from the Himalayan foothills in east Punjab, to Gujarat in the south and east, and additional locations in the far west were discovered too. Some of the ruins were damaged around 1857 when engineers constructing a railroad carelessly used bricks from the ruins to build their track structure. Thankfully, for Indian history, many ancient artifacts were found, still in tact, at this location. The Indus Valley civilizations were mostly urban cultures that thrived from agricultural production and trade. Tribesmen have been characterized as organized, having planned and built private living areas for the village people within brick homes. They also built and fortified ancient religious temples and special rooms for their leaders. Copper and bronze were used by this ancient civilization; they also dyed cotton and used it to make colorful clothing. Wheat, rice, and a variety of vegetables and fruits were grown here, and some animals, like bulls, were domesticated. Archaeologists have found found pottery that appears to have been made on pottery wheels, complete with painted designs. These ceramics have been found at all the major Indus Valley Civilization sites, indicating that early Indian people valued practical ancient art and used it as an item for trade with other ancient civilizations. Leave Harappa discover more of the Indian culture. Visit our homepage and continue exploring India.